Google, in all its infinite wisdom, is yet to come up with a single, unified platform for payments. Users often have to struggle with multiple applications such as Android Pay, Google Wallet, etc. to pay for Google services, but this is all set to change now. Google announced that it’s consolidating all platforms under the Google Pay banner. We all have fond memories of Google’s first NFC-enabled payment portal AKA Google Wallet, which then got rebranded to Android Pay, which, to be honest, got a tad confusing for some users. Following the footsteps of its arch-rival Apple, Google is all set to rebrand all of its payment portals (including Chrome autofill) under the Google Pay banner. Google Pay is aimed at becoming a unified platform which can be used for Play Store transactions, payment at NFC-enabled booths and miscellaneous online transactions (to pay for stuff purchased from the Google Store). With Google Pay, it’ll be easier for you to use the payment information saved to your Google Account, so you can speed through checkout with peace of mind. 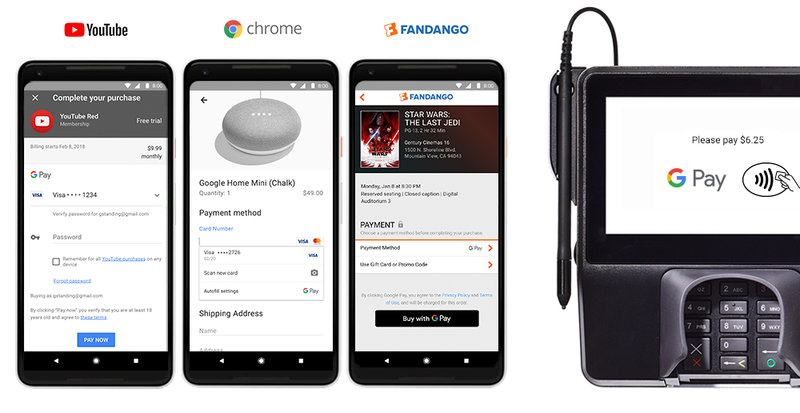 Over the coming weeks, you’ll see Google Pay online, in store, and across Google products, as well as when you’re paying friends*. The rebranding effort is already underway, with some existing users already witnessing the Google Pay rebranding at several locations. Google Pay is already available on Airbnb, Dice, Fandango, HungryHouse, Instacart, among others. Google says you’ll see Google Pay online, in-store, and across Google products, as well as when you’re paying friends. You can find out more about it on Google’s blog. How often do you use Google’s payment service? Have you noticed the Google Pay branding yet? Let us know in the comments below.